and I live in Indianapolis. I've had the privilege of making my living with a guitar for the past 22 years. My first Telecaster was a '73 Tele Deluxe and I've been hooked ever since! I'm in a rockabilly band in Indianapolis called "Bigger Than ELVIS", (our website is www.biggerthanelvis.com) and my wife and I also perform together in an acoustic duo. 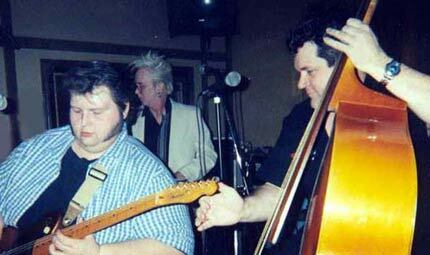 My favorite guitar players are Danny Gatton, Scotty Moore, and Angus Young. 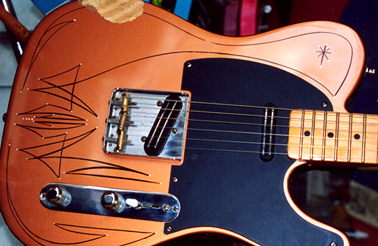 The main modifications I make to my Telecasters are pickup and parts swaps. 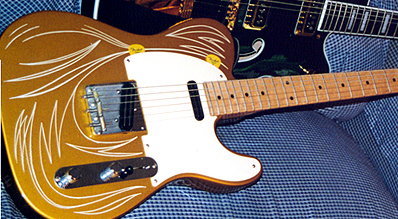 I have Joe Barden pickups in most of my Telecasters. I always use compensated brass saddles and immediately put them on any new addition to the family. I feel they are a must for any Tele picker serious about intonation and absolutely love them. This Gatton model Telecaster is the money maker, I can honestly say I've never been happier with any other Fender product. It has Joe Barden pickups, 1MEG pots and Vintique style hardware. The only thing I changed on it is I took out the cubic zirconium fret markers and modded it by adding a custom pinstripe job. This is a US '52RI that I played every single Friday night as well as many gigs in between for three years straight. It was basically my Gatton model until I could afford a real one - I added Joe Barden pickups as well as compensated saddles and a custom pinstripe job. I also prefer a strat style switch tip.